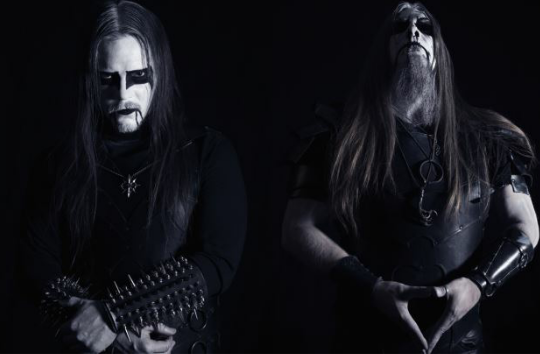 After debuting their new bassist and new vocalist in their new song “Nail Them To The Cross,” Dark Funeral have officially introduced their new members. Their new vocalist is Heljarmadr and their new bassist is Natt. With roots in the second half of the 90’s black metal scene and with tentacles in bands such as highly respected Grá, Domgård and Cursed 13 comes a raw force from the underground. Known as a fierce frontman, both on stage and on recordings with his previous bands, he will now step up and claim a seat in the throne room of DARK FUNERAL to inflict deep scars and infect wounds in the black metal scene. The name Heljarmadr derives from the old Scandinavian languages, simply meaning “a man belonging to hell”. With long time experience in the arts of creating dark satanic music, he will play a key role in shaping the future vocal and lyrical direction of DARK FUNERAL. Expect nothing but excellence, pure darkness and uncompromising evil! Treading into this world, Natt has always had a strong, deep interest in music and the arts of the great unknown. Spending time during the nights, exploring the Swedish ancient forests, avoiding the common mass that wanders this simplistic world, made his relations and visions to that which lies beyond, stronger. towards the isolated parts of the soul, a connection within and beyond. A connection to what can not be seen, nor heard. To what is, and what is not, and that which lies between. Outside the borders of this life. This entry was posted in Dark Funeral, News and tagged Dark Funeral, Heljarmadr, Metal, Natt, new bassist, new vocalist. Bookmark the permalink.